Inclusion in a group so-titled gladdens my heart. Our blog’s name is the end-all/be-all descriptive phrase in apposition I’ve had in mind since I learned my ABC’s. For most of my Little Girl Years, I played at school, knowing teaching was something I’d someday do. But buried deep within my pretend teacher’s heart was a want and a wish to someday author children’s books. When readying books to share with friends and dolls, I’d close my eyes and picture my name following the Written By on the chosen book’s front cover. Teaching came easy. A Bachelor of Science in Elementary Education from the University of Pennsylvania. An Illinois K-8 Teacher’s Certificate. Fifth grade teaching assignments in outstanding Chicago-area private and public schools. The authoring, however? The authoring proved hard. Despite my Journalism coursework at Penn’s Annenberg School for Communication and my published educational textbook writing, years and Presidents (two re-elected!) came and went while I told my stories across formats and genres, learning my craft, honing my craft, digging deep to uncover my voice. A die-hard Cubs fan, I knew, I believed: my next book would be The One to win me the wished-and-wanted naming word Author. 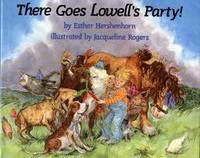 How fitting that my first published book, the Holiday House picture book There Goes Lowell’s Party!, told of a Birthday Boy who never stopped believin’. His Ozark kin would a-make to his party, no matter the twisters those May storms a-spawned! Fortunately, one published book led to another. As further luck would have it, my hard-won authoring returned me to the classroom. The former fifth-grade teacher in me couldn’t sit still. She and I embraced the opportunity to once again teach, only this time Writing - and - to writers of all ages. I now share my books, process and writer’s life with young writers in public and private city and suburban schools across Chicago, Illinois and the Midwest. And I do the same, teaching Picture Book and Novel workshops to young-at-heart writers, at the Newberry Library and the University of Chicago’s Writer’s Studio respectively. Inside the classroom as well as out, whether presenting to or coaching children’s book writers, facilitating Writer’s Groups or readying teachers to help them grow young writers, I inform, affirm, inspire and celebrate. I ready the soil, so to speak, then seed and feed. Helping others tell their stories well is how I spend most days. 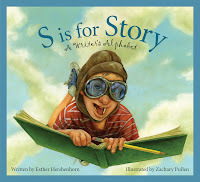 In many ways, S is for Story: A Writer’s Alphabet(Sleeping Bear Press, Fall, ’09), my newest book, is but the proverbial cherry that tops my sundae’s whipped cream. Both my writing and teaching experiences informed the A to Z entries. It’s the book I wish I’d owned when I first learned my letters and tucked away my dream of writing children’s books someday. Thanks to my five fellow children’s authors who also teach writing, I’ve entered a new classroom of sorts, this group blog in Cyberspace. I welcome yet another opportunity to teach writing to all ages, to share my stories, life and process with present and future authors. Creating the above introductory biographical blog entry forced me to determine my professional story’s essence, to single out its key, relevant elements - i.e. teaching and authoring. Once I had the answer I thought next about my readers. Then and only then did I put fingers to keyboard. Try your hand at writing your get-acquainted biography, as a blog entry or the copy on your website’s home page, as a brief bio perhaps that appears beneath a presentation’s title or beside a piece of original writing, or maybe as the shortened back flap copy for your next published book. What are the key, relevant elements of your professional or life story which communicate the essence of who and what you are? What are your nouns, your naming words, which tell the world about you? What are your verbs, your action words? How might you combine these parts of speech, originally, interestingly, to tell your story instantly? And, remember: no where is it written you can’t create shorthand biographies for your story’s characters. In fact, branding your story’s characters – real, imagined, major and minor, helps you create rounded characters ready to claim the stage. Try the above exercises for any and all characters. My own branded characters include Lowell Piggott, the silver-lining finding Birthday Boy in There Goes Lowell’s Party!, Rudie Dinkins, the memory-stirring soup-maker in Chicken Soup By Heart, Howie Fingerhut, the junior businessperson dreamer who authors The Confe$$ion$ and $ecret$ of Howard J. Fingerhut, and Pippin Biddle, Fancy That’s young portrait painter family man. In my April 22nd post introducing this blog, I neglected to mention one of the regular features we plan to include here: Writing Workouts. These will be writing exercises that can be used by young writers and those who are, as Teaching Author Esther Hershenhorn likes to say, "young at heart." We invite classroom teachers to try these exercises with their students, and adult writers to try them on their own. Afterward, we hope you'll let us know whether you found the exercise helpful. 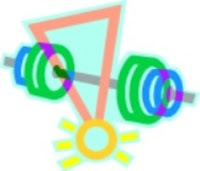 We chose the above image--a set of barbells and a ribbon with a medal--as the logo for our Writing Workouts because everyone who works out with us is a winner! The logo will serve as a visual clue to make it easy to find the Writing Workout within a post. And all posts containing a workout will be indexed under Writing Workout in the sidebar Subject Index . Our first Writing Workout will appear in tomorrow's post by Teaching Author Esther Hershenhorn. Enjoy! I didn't always want to be a writer. First, I wanted to be a teacher. Silly as it may sound, that desire was inspired, in part, by a board game. 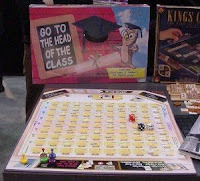 Around age 8 or 9, I became addicted to "Go to the Head of the Class." I soon memorized all the answers. Of course, that meant no one would play it with me anymore. So we played school instead. Being a whiz at "Go to the Head of the Class" meant I usually got to stand at the chalkboard easel and be the teacher. I loved it! The thrill of seeing my writing--and my name!--in print inspired me to dream of being a professional writer. While still in high school, I had a few more poems published, and even an essay in a local newspaper. But in college, I became more pragmatic. There weren't many teaching jobs available then, and I knew it would be tough to make a living as a writer. So I majored in Computer Science instead. (Lucky for me, I liked math and science, too.) I had no trouble finding a programming job after college. And I did very well. Too well. I worked long hours and was on call 24/7. After 5 years, I burned out. I quit programming and took a job at a computer training company. There, I wrote training course materials: lessons, exams, and video and audio scripts. The new job soon rekindled my interest in creative writing. When my son was born, I decided to become a full-time mom and a part-time freelance writer. I worked for a local paper for five years and also had pieces published in the Chicago Tribune and several national magazines. At the same time, I was reading regularly to my young son. I soon fell in love with children's books, especially picture books. That's when I decided to become a children's writer. I went back to school and completed an MFA in Writing for Children and Young Adults at Vermont College. While there, I started writing a middle-grade novel called Rosa, Sola, which was eventually published by Candlewick Press. When I held a copy of Rosa, Sola for the first time, I felt the same thrill I'd experienced at age 16 upon seeing "My Sanctuary" in print. Only this was WAY better, because my name was on the COVER! My MFA degree yielded not only a published book, but also the credentials to be a real teacher. I began teaching writing classes for adults at a local college over ten years ago. Later, I added summer and after-school writing classes for children and teens at a nearby arts center. Now I also have the privilege of presenting writing workshops in schools and libraries. I still love standing at a chalkboard (or whiteboard) in front of a class. The only difference is, I don't have all the answers anymore. But I am happy to share with my students what I have learned--and am still learning--about writing. I consider myself incredibly blessed to be able to combine two things I enjoy so much, teaching and writing, into a career as a Teaching Author. Welcome to our group blog! (Or what some call a "glog.") We are six children's book authors with a wide range of experience teaching writing to children, teens, and adults. Here, we will share our unique perspective as writing teachers who are also working writers. While part of our goal is to discuss what we've learned about writing and the teaching of writing, we also hope to accomplish something here that we can't do on our websites: facilitate conversations between writers, teachers, and librarians about the subjects we love best--writing, teaching writing, and reading. To encourage that interaction, we would like to solicit topic suggestions from you, our readers. Please see the "Ask the Teaching Authors" section in the sidebar to submit writing or teaching questions you would like addressed here. This blog is a work-in-progress. The current plan is to post three times per week, rotating through a schedule that has each Teaching Author posting every two weeks. We will begin our regular posts on Monday, April 27, with a series about who we are and how we became Teaching Authors. That series will end just in time for Children's Book Week (www.bookweekonline.com/), which will relate directly to our second topic. We have ideas for additional features, including reviews of books on writing and interviews with other Teaching Authors. However, our main goal is make this blog a valuable resource for teachers, librarians, and writers. Please let us know how we can best do that. We want to hear your voice! Coming soon: the Teaching Authors! I'll soon be posting an announcement about this blog, Teaching Authors: who we are, what we do, and what we plan to discuss here. So watch this space!